Here is the background for understanding what’s at stake – beginning more than two centuries ago. To best maintain that balance, this confrontation should be resolved in the political realm, not in the courts. Congress can avert this problem. 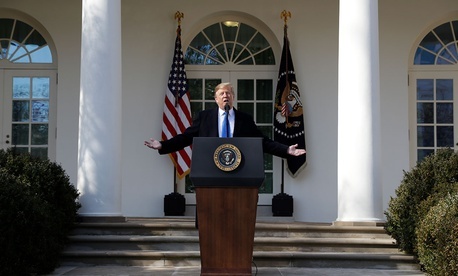 The 1976 National Emergencies Act gives Congress power to invalidate a president’s declaration of emergency by a resolution passed by simple majorities of both houses. Nancy Pelosi, speaker of the House, announced that the House would vote Tuesday on a resolution to block the emergency declaration. White House adviser Stephen Miller has already suggested that Trump would veto any such resolution. “He’s going to protect his national emergency declaration. Guaranteed,” Miller said on Fox News. Both the House and the Senate would then need two-thirds majorities to override his veto. We believe that for Congress to protect the constitutional order, its members must muster the necessary two-thirds majority. On April 9, 1952, President Truman declared a national emergency. In the midst of the Korean War, he seized the country’s steel mills on the eve of a nationwide strike because steel was necessary to make weapons. The steel companies immediately brought a lawsuit against the seizure in federal court. President Trump is acting contrary to Congress’s will by appropriating money Congress has refused to appropriate. He signed a carefully constructed compromise budget bill passed by more than veto-proof two-thirds majorities in both houses. He accepted the US$1.375 billion that the bill gave him for a border wall. Congress’s adoption of a joint resolution seeking to invalidate Trump’s emergency declaration – an explicit statement of congressional will – would provide conclusive evidence that would only strengthen the argument that the president is acting contrary to Congress’s will. Imposing such a veto override requirement, however, would eliminate the court’s role. That’s because a presidential declaration of emergency is immediately invalid if Congress overrides a presidential veto. Two-thirds overrides are historically unlikely by Congress. And requiring a two-thirds vote would give a president who declares a national emergency virtually unlimited power to appropriate money to his or her heart’s content – perhaps hundreds of billions of dollars to address, for example, climate change by subsidizing construction of wind farms. Congress has already spoken through passing the spending bill and will be considering a resolution to invalidate the president’s declaration of emergency.